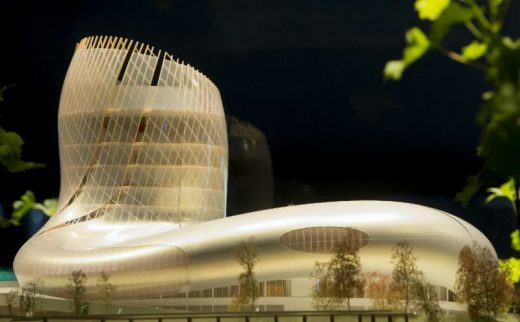 The Bordeaux-based wine museum and cultural center known as La Cité du Vin opened its doors on June 1, 2016. It will draw visitors into an unparalleled discovery of wine-growing civilizations from all over the world. The architectural takes suggestions specifications and urban landscaping and wishes of a vertical fragmentation increased, and a breakdown in “skyline” of volumes. It results from it a volume under which slides the slope. It is “tense” in its ends by relief’s which participate in» the anchoring «of plan in its environment (soil, streets, sky). An urban balcony on the quarter. A covered square leads to the foyer, which it accompanies in its rise towards the high level of the quarter. The Plinth unfolds itself along the elevation creating set backs and notches where the different volumes snap in or detach themselves from. This interaction creates a tension link between the volumes. The sculptural as well as urban solution, anticipates the future buildings in the surrounding parcels. It is an urban sculpture shaped by its environment. This project was the discovery of the work, sculptures and workshop Patrick Roger. Through him the chocolate has emerged as a world of flavor, taste, and as a material for reversible property changes state from solid to liquid state. May 6, 2016 in Architects.